Jerrica is the daughter of a famous recording engineer and inventor Emmett Benton who after his death left behind his recording company, Starlight Music and Starlight House, a foster home for young girls. Since she is the oldest she is running the two while managing a famous Rock band The Holograms and trying to kept her boyfriend Rio from finding out her true identity. 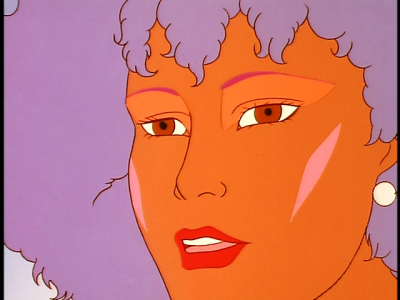 Jem is a holographic disguise worn by Jerrica, made by Syngery, a computer made by Emmett Benton. Only the other band members know the true identity. 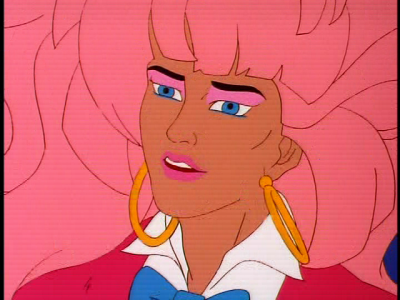 Jem is the lead singer in the Holograms and has a boyfriend Rio (kept in mind he doesn't know she is really Jerrica) and also flirts with Riot of The Stingers. Aja Leith is Jerrica's best friend since childhood when she came to live with them. She also has a passion for cars and motorcycles which means she loves to drive. Aja is also very athletic and falls in love Craig Phillips, Stormer's brother. 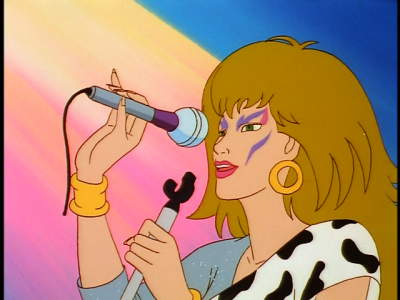 She plays guitar and sings background vocals for the Holograms. Shana Elmsford was the Benton families second foster girl. Shana is a fashion designer for the band and Starlight girls. She gives extra tutoring to the girls in art, sewing, and music. Since Lindsay Pierce introduced Anthony Julian to her, they have been a steady couple. Shana plays drums and bass guitar while singing backgound vocals. 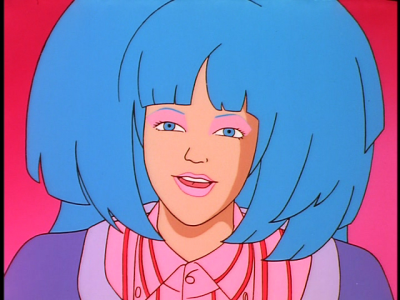 Kimber Benton is the youngest Hologram and youger sister to Jerrica. She is very emotion and is less mature then Jerrica but isn't dumb. Kimbers love is between 2 men... Sean Harrison and Jeff Wright. She writes the music and lyrics for the band & plays keyboards while singing background vocals. Carmen Alonso is the newest Hispanic Hologram. Her family has 4 sons and 3 daughters making her the oldest girl at 18 years old. Her father Miguel, runs a gardening and landscaping business. The only love life they show her having is with a tour guide in Aztec Enchment. Raya plays drums and sings background vocals. Synergy is a computer designed by Emmett Benton gifted to Jerrica along with cloths, band gear, and a roadster. He made a lot of Synergy to be like Jacqui Benton his wife who pasted away on a plane flight. 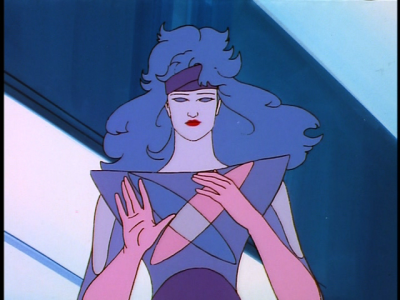 Synergy is the one who macks all the fantastic holograms and Jem. 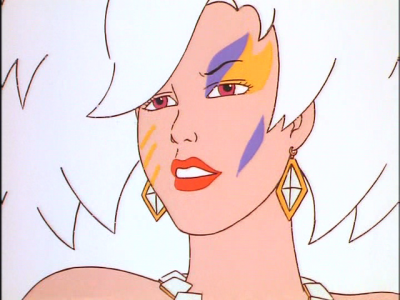 She is controlled by Jem/Jerrica's Star Earings. Only Jem/Jerrica, Aja, Shana, Kimber, Raya, and The President know about her. Rio is Jerrica's and now Jem's boyfriend! He has know Jerrica for a long yet see can't tell him the truth. 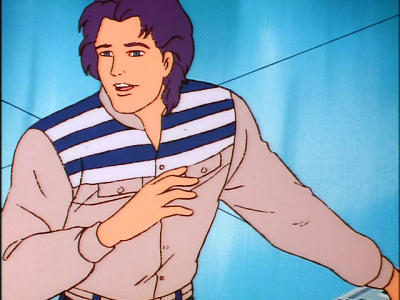 He met Jerrica through her father because he did some engineer work for him. Mr. Pacheco records all the music for the Holograms and is also their road manager. 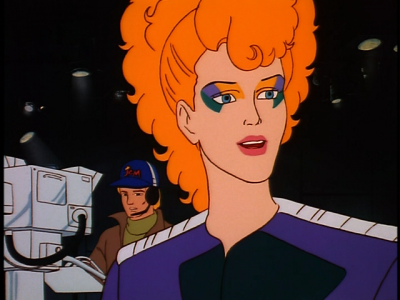 Nicknamed Video because of her love for flim has dicrected all of Jem and the Holograms Music Videos and has a cousin on the show, Constance Montgomery aka Clash! Danse is the name you uselly here because all she does id dance, dance, dance. She couldn't find her mother and father but found her father when she went back to her home town. Danse is also a cuncellor at Haven House, a refuge for runaways. 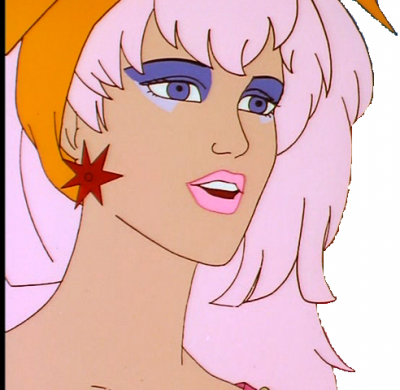 Besides that she dances in most of Jem and the Holograms Music Videos. Ms. Pierce is like a MTV host in a way. 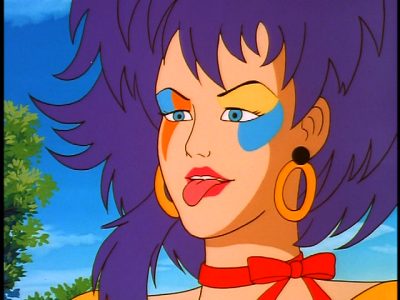 She plays all the hostest music videos including Jem and the Holograms. Ashley is one of the 13 Starlight girls at the Starlight mansion. She in into fashion. In the beginning she is rude and cude but as time goes on she becomes friendly and caring. 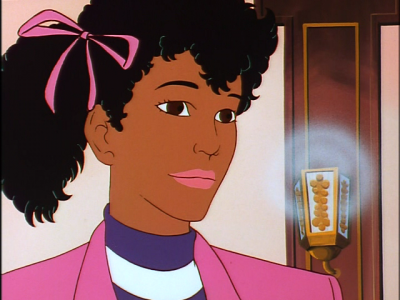 As well she and the other Starlight Girls don't know Jem is really Jerrica Benton. Ba Nee loves to collect books and is a little girl who is in search for her father. In the end she find him and also was theated of blindness in season 2. 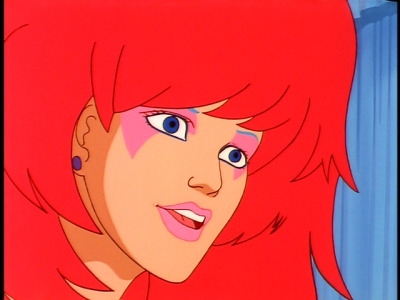 She doesn't know Jem is really Jerrica. Krissie is a fun loving girl and respects everyone but that one time when young Luna Lurners son came. 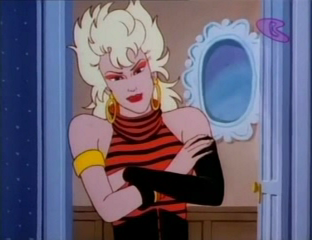 Along with the other girls she doesn't know Jem is Jerrica. 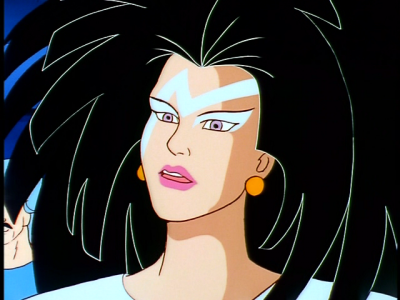 Pizzazz's real name is Phyllis Gabor and she hates it! Roxy will never hesitate to use it to irritate her. She gets all her money from Harvey Gabor, her father. If she wants anything all she has to do is ask a 100 times and she'll get it as long as he gets some peace and quiet. Her mother left them when she was a young girl. Shes also lovesick for Riot. She plays lead guitar and sings lead vocals. She also writes the lyrics to all the songs. She plays guitar and sings background vocals. Unlike the other Misfits Stormer grew up in a loving household. 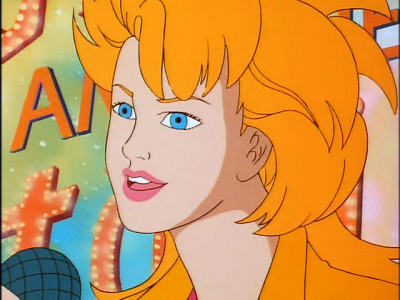 Her real is Mary Phillips but the name Stormer was given to her by Pizzazz. She is the youngest member and is very shy and is always under Pizzazz's thumb. Her brother Craig is also on the show, but his not as tough as The Misfits, he falls for Aja. She plays keyboard guitar, sings background vocals, and writes all the music for the band. Her birth name is Sheila Burns and she grew in a lower class British family. Jetta, just like her parents, is a con artists. She dresses like a punk but isn't a true "punk". In her spare time she joined a band "The Tinkerbillies" ("tinkerbilly" is slang for pseudo-rock'n'roller - someone pertending to be something he isn't). The Tinkerbillies came to the US, but got kicked out by the Immigration Dept. because they were rude and crude. 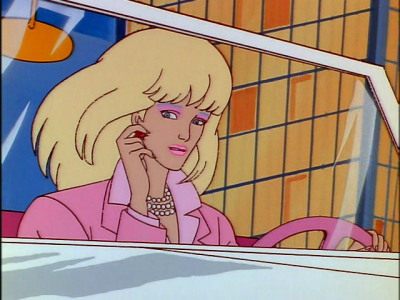 But when The Misfits found her, Pizzazz got Jetta a Resident through her father's money. Shes also always saying shes friends with the Queen. Jetta plays the Sax and sings background vocals. Constance Montgomery is Clash's real name which means she is Vivien's cousin. There fathers are twins (not identical) and Clash and Video were born at the same time in the same hospital! Talk about freak accidents right? Since the beginning of there childhood Clash would always be break Vivien's toys, tell on her, steal her homework as well as friends and boyfriends. Constance saw The Misfits in concert one day and her life was changed. She adopted their look, sound, and life style. When she met them one day they let her be a Misfit. 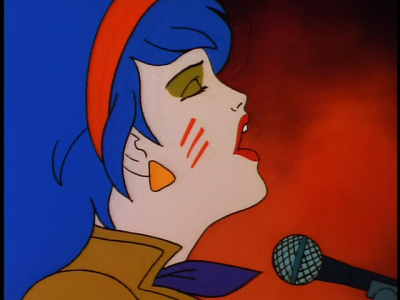 She always what to be in the band but Pizzazz would never let that happen. 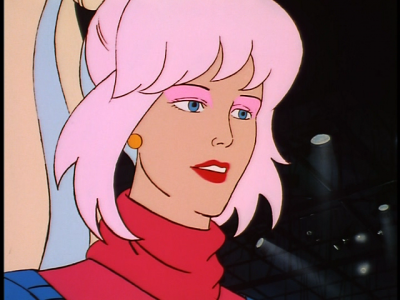 Clash spies and messes up Jem and the Holograms lives. Eric Raymond is the head of Misfits Music and is the manager of The Misfits. 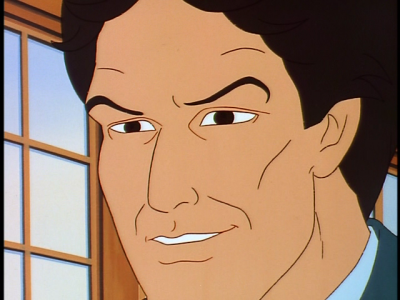 He started working for Emmett Benton which was when Jerrica was a little attaracted to him, but not for long. 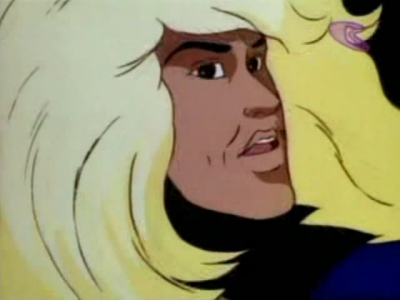 He is always trying to find a way to destroy Jem and the Holograms career besides find out Jem's true identity. AKA Eric's secret weapon is only know by The Misfits and Eric. 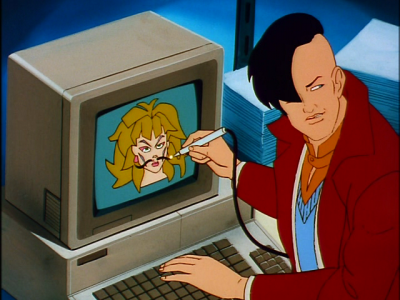 Techrat is a computer genius and is always tries to come up with a new gimmick for The Misfits. Techrat is about 22-23 and has a soft voice (male or female). The "Secret Weapon" lives in a garage like worshop called The Rathole. Rory Llewelyn had a sad childhood. His father was always disciplining him, but at least his mther loved him. She teached him how to play the panio. Yet again when she tried to her husband said it was for sissies. Riot was teaching him self to play the guitar but when his father saw him he said it was for sissies. So Riot joined the army to please his father and to get away. He would always try to go to a club as much as he could because he loved the music. But one night they need a guitarest and he soon he joined the band. Later on he was be coming better then the lead guitar player so he and Minx quit and found Rapture on the streets. Ms. Krueger is interested with Rio but he doesn't need a third women in his life. Can you believe she use to like Eric?!? So far, 1500199 visitors (4901502 hits) truly outrageos people have been on this page!